My daughter is going to attend a small birthday party later in the afternoon. The birthday present has been prepared and the only thing missing is a card. 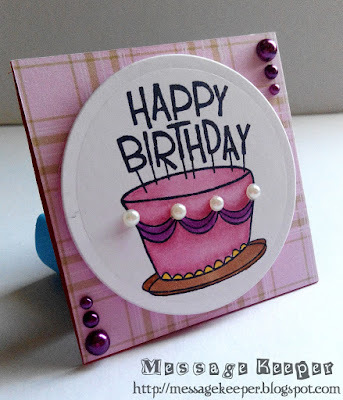 Thus, I quickly pull out my crafty stuffs and make a mini birthday card for her. 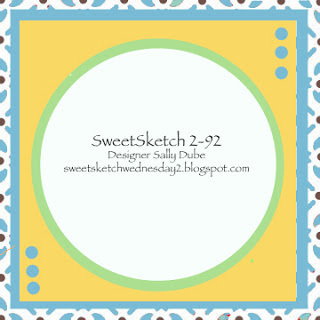 For this mini card, I am adopting Sweet Sketch Wednesday 2 (SSW2) - Sketch 92 as shown above. 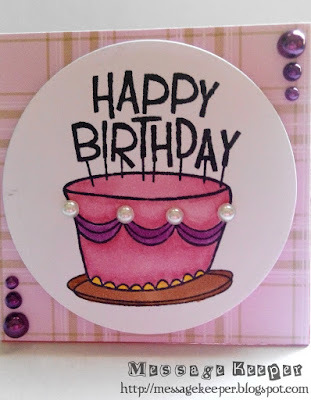 On a white circle, the birthday cake with sentiment is stamped and colored using Copic markers. While on a red lunchbox note die, a pink plaid pattern paper is attached onto it and the excess the trimmed. 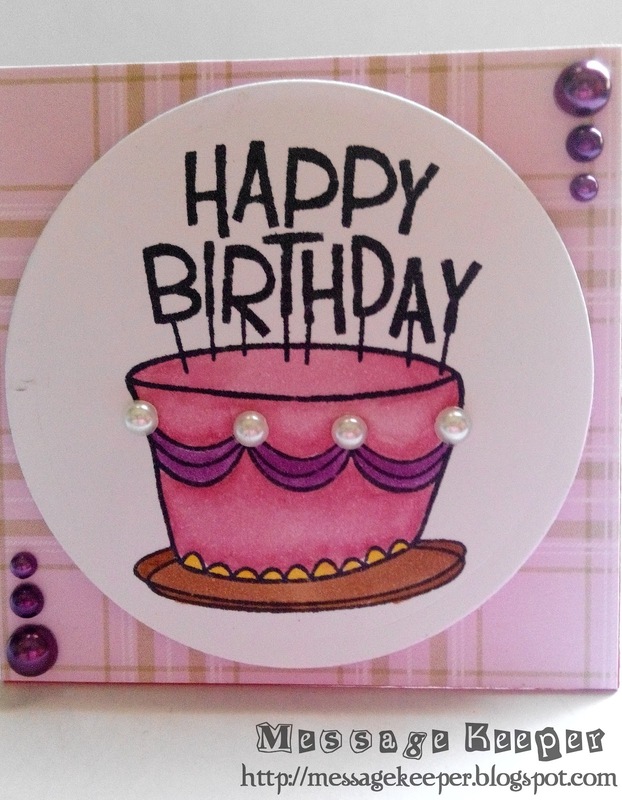 Then, the circle birthday cake is attached on top of it using foam tape as shown the sketch. As final touch, four (4) white pearls are added to cake decoration. Another two (2) sets of purple pearls that contain three (3) sizes are attached onto the card on the bottom left corner and upper right corner as in sketch. Such a sweet card!! Love all the added pearls. Thanks for joining us at Sweet Sketch Wednesday 2. This is such a great creation, love the colours you have used. Thank you for playing along with us at Sweet Sketch Wednesday 2. What a lovely birthday card! Love the plaid background and the pink cake!! Please display the story board in your blogpost and the logo in your sidebar, so that others can find this challenge too! 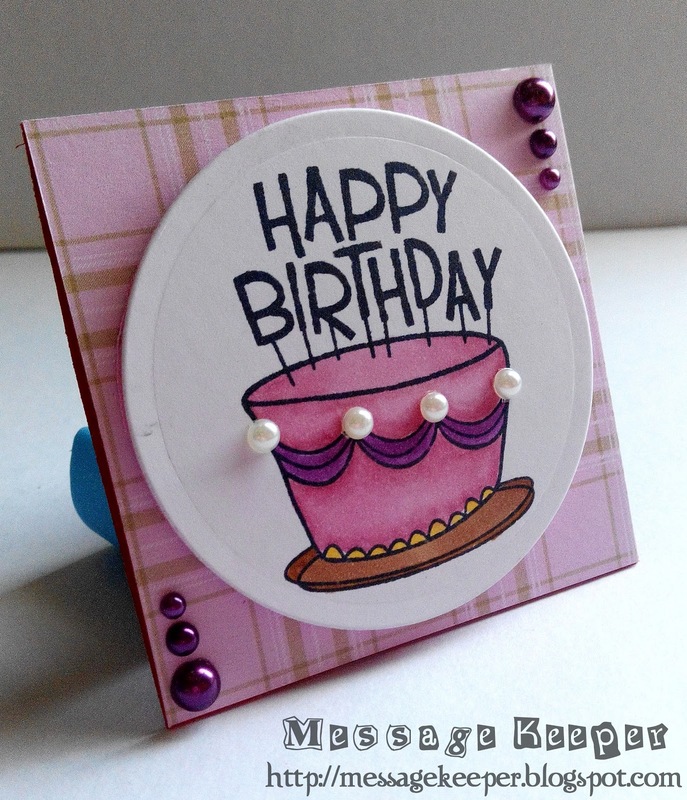 What a lovely birthday card, such pretty design papers and those purple gems are the perfect finishing touches to a lovely card. Great card and thanks so much for sharing it with us over at Sweet Sketch Wednesday 2 and good luck. Love your project! Thanks so much for joining us for our July Anything Goes at Catch the Bug! I hope you join us next week for our Sixth Annual Christmas in July weeklong event you will find lots of inspiration and some wonderful prizes!